Tantalise your palate with our delicious Appetizers. Crispy, freshly made Pakoras of Chicken & Veggies are served with a sauce that is medley of minty, spicy goodness and has the right mix of flavours to wake your senses. 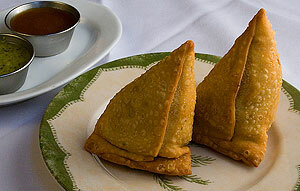 Our Veggie Samosas are a classic, traditional accompaniment to the perfect meal. Or just try it all with our special Chef's Sampler Platter! Savor the smoke kissed goodness from our Tandoor! Made direct from India, our traditional Tandoors, or clay ovens, cook meats, breads and more the traditional way; with high heat from charcoal for that smoked aroma that's to die for! Sink your teeth into our succulent Chicken Tikka, delicately marinated and lovingly cooked to juicy perfection. Accompany that with fluffy Naan bread and an ice-cold pint of Kingfisher for the perfectly rounded gastronomical experience! Put Some Curry In Your Belly! Take your time to savour the flavours of our real curries, made with fresh cream, cashew nuts, butter and natural spices. Dip our Tandoori Breads and your fingers into tender Butter Chicken, spicy Rogan Josh, and Fish Masala; plus delicious Palak Paneer and Chana Masala for those strict veggie lovers!